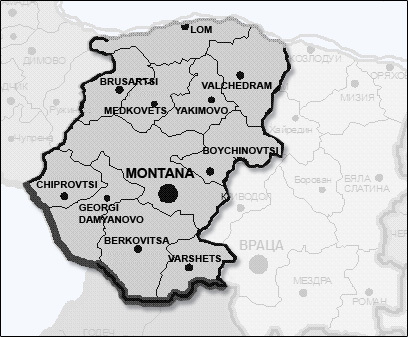 The district of Montana is situated in the Central part of North-Western Bulgaria. To the North the district borders on the Danube river. To the South-West it is in the immediate vicinity of the Republic of Serbia and Montenegro and the district of Sofia; to the East it borders on the district of Vratza and to the North West on the district of Vidin. The district' s territory is 3 635 sq.km, it has a population of 170 217 people (according to the official data 31.12.2004), and average density of the population is 47.7 people per sq.km. The territory of the district is crossed by two major transport routes both part of the TINA network. 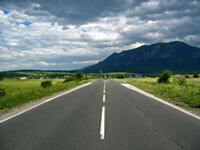 These are Eurocorridor 4 (international highway E 79) Vidin-Montana-Vratza-Sofia-Kulata and Eurocorridor 7 - the Danube river.The shortest way from the town of Vidin to the capital of the country Sofia (second class road II 81) also crosses the territory of the district via the Petrokhan pass in Stara planina mountain. The way is used as a connection between the port in the town of Lom and the one in the town of Thessaloniki (Greece). Relief of Montana district is various being flat to the North where the plain of the Danube river is and hilly to the South where it nears the front parts of Stara planina mountain. The Southern parts of the district include the highest peak of Western Stara planina Kom (2 016m) Here goes by the shortest way from the North-Western to South -Western part of Bulgaria via the Petrokhan pass. Climate of the district is moderate determining a cold winter and a hot summer. The average temperature level is 11.1 degree. Mineral spa resources are a valuable asset for the district. The ones in the Spanchevtzi village and in the town of Varshetz are well-known because of their contribution to the treatment of cardio-vascular problems and also central and peripheral nerv system disease. There are also mineral spas in the villages of Barzia and Borovtzi which are used for the agricultural processing of the land within the municipality of Berkovitza. 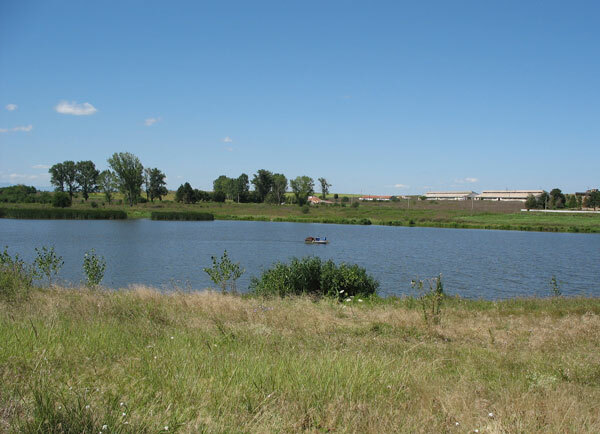 The territory of the district includes the dam lakes of Ogosta and Sretchenska bara and about 50 micro ones. 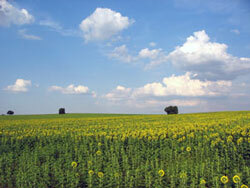 Soils in the district are widely spread via different types of zones heading from North to South. The plain of the Danube river is characterized by huge territories of black soil while the front part of Stara planina is rich of grey soil - a specific type of forest soils. Brown and mountain types of soil are identified in the central part of Stara planina.The characteristics of the soils favour the development of all aspects of agriculture and especially cattle breeding. There are natural resources for strawberry and raspberry growing. Ores and minerals are predominantly characterized by a variety of raw materials used for construction building such as granite and limestone. There is a source of fluorite within the Chiprovtzi municipality. Lots of territories are currently used for extraction of various construction building materials. Industrial sector is the leading one. Its productiveness is of great importance for the stamina of the local economy. Some of the branches which dominate the sector are: Metallurgy , production of metal articles and machines; Production of food and drinks; Trade and technical services. The municipalities of Berkovitza, Vurshetz, Chiprovtzi and Georgy Damyanovo have a considerable potential for development of eco, balneotheraputic and alternative tourism. The port in the town of Lom is an important infrastructural unit. It is also called "the gate to Central and Eastern Europe". 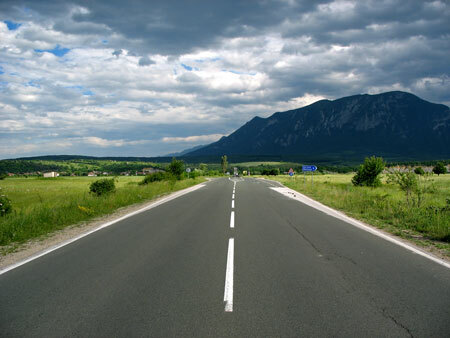 Its national importance is predetermined by the key location of the town of Lom which causes it to be the most effective connection between two international European transport routes eurocorridor 7(Danube river) and eurocorridor 4 (the connection with the port in the town of Solun). Cargos coming from the port of Lom are heading West to the towns of Regensburg and Duisburg in Germany and East and South to the countries from the Black Sea region and the Mediterranean. The port of Lom forms a total share of 40% of the transportation of cargos in the Danube region and according to the official data for 2004 it forms a share of 24% of the cargos that have been processed on the bulgarian territory. This share is only 10 % less than the one of Rousse (34%) - the biggest bulgarian port alongside the Danube river.